Mike Ullery | Miami Valley Today Nick Goodin of Quality Masonry in Marion, Ohio, works on tuck pointing brick at the old Mo’s South Seas Lounge building on South Main Street in Piqua on Tuesday. The renovation of the building is part of the city’s Riverfront landscape project. Nick Goodin of Quality Masonry in Marion, Ohio, works on tuck pointing brick at the old Mo’s South Seas Lounge building on South Main Street in Piqua on Tuesday. The renovation of the building is part of the city’s Riverfront landscape project. 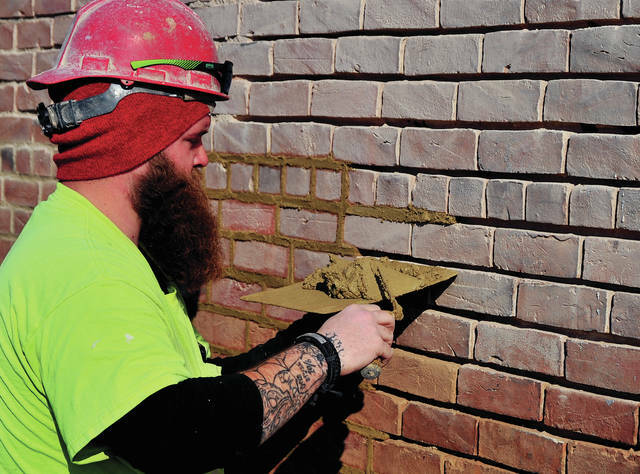 https://www.dailycall.com/wp-content/uploads/sites/30/2019/03/web1_031919mju_mos_brickwork-1.jpgMike Ullery | Miami Valley Today Nick Goodin of Quality Masonry in Marion, Ohio, works on tuck pointing brick at the old Mo’s South Seas Lounge building on South Main Street in Piqua on Tuesday. The renovation of the building is part of the city’s Riverfront landscape project.